My thoughts on Derek Stepan’s new contract, Jeff Gorton, and the team’s future. Photo courtesy of MSG Photos. 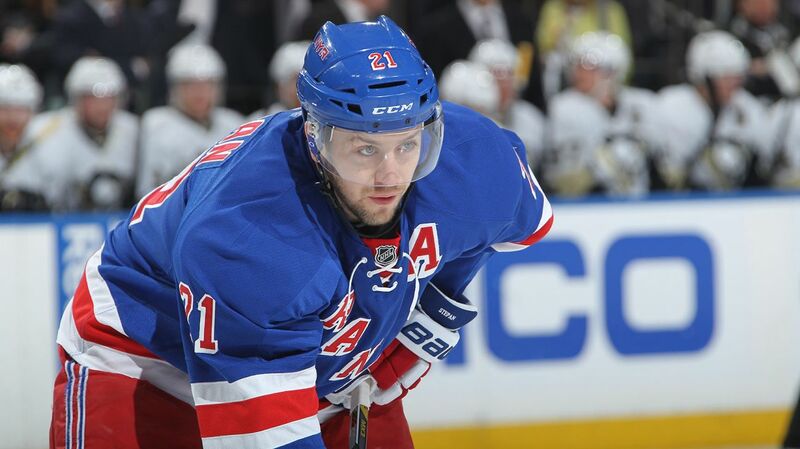 Yesterday, we saw Derek Stepan finally re-sign with the Rangers, opting to stay in New York for the next six years. The deal will pay him an average of $6.5 million until he turns 31, which means that he will be an integral part of the Rangers for years to come. Of course, with every signing or update, I usually have some thoughts and opinions on things. This is a new “series” of articles I will be doing, usually shorter in length, where I’ll discuss my thoughts on the Rangers and what is going on around the league. If you guys like this type of article, leave feedback in the comments section here, on Twitter (@The_RangerZone), or on The Ranger Zone Facebook page. Jeff Gorton did a great job structuring this contract. The length is great at six years, with the Rangers locking up a young player entering his prime as he continues to improve every year. This isn’t a long term deal handed out to an aging veteran. The team made the right move keeping him through the rest of his 20s. Think back to when Stepan was averaging a point per game during the season, and was probably the best player on the ice not named Rick Nash. I would have said that he was worth $6.5 million. With guys like Ryan O’Reilly getting $7.5 million a year, Stepan’s contract is about where it should be. It will look even better when players comparable to him are making $7 million or more per season. And in a worst case scenario, if the Rangers had to trade Stepan, the contract is structured perfectly to do so. The first two years have no clause, as they would have been RFA years and cannot have and clauses. The third and fourth year has a full no trade clause, and the final two years have a limited NMC, which means that Stepan would submit a list of 15 teams that he would accept a trade to. The contract is frontloaded, with Step getting $8 million in the first year, and $5 million in the final year (not cap hit). That makes him much easier to move if it winds up getting to that point. No bad blood between the Rangers and Derek Stepan. After the signing was announced, both Stepan and Gorton commented that they were very happy to come to an agreement on a long term deal. Stepan said that both sides were trying to reach a long deal from the get-go, that there was very little talk of arbitration, and that there was “no bad blood” between the two sides. The terms were always close, and it was handled well by both sides. The Rangers have not let a forward get to arbitration since 2009. 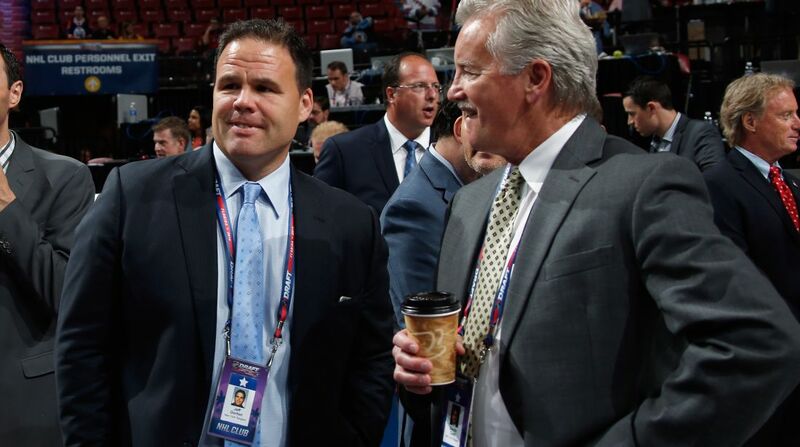 Jeff Gorton has been fantastic in his one month as the New York Rangers GM. Photo courtesy of the New York Rangers. Jeff Gorton has done a fantastic job assembling the team since he took over on July 1st. Before signing Stepan, he took care of all of the other needs first, making smart, logical decisions and signings. He brought in Viktor Stalberg and Raphael Diaz on cheap, one year deals to increase the team’s depth. He shipped out Carl Hagelin, who was due for a big raise, and brought in young talent in Emerson Etem, a prospect with tons of upside. He got JT Miller and Emerson Etem to accept their qualifying offers, although they may have done so to save arbitration rights. And he also managed to retain Jesper Fast and Oscar Lindberg on very affordable two year deals. All of the moves were really well handled, and he was able to manage the team under the salary cap, leaving about $800k in free space. Great work by the new GM. My initial guess is that Gorton isn’t done yet. As of right now, there’s one forward too many on the roster, and there is a logjam of defenseman. By giving Lindberg a one-way deal, it implies that management trusts him to make the team out of camp. Does that mean that Glass would get traded or buried in the NHL? Will a player like Stalberg get shipped out at the deadline like Stempniak? On defense, Raphael Diaz, Dylan McIlrath and Brady Skjei all could feasibly fight for the seventh defenseman spot. That’s likely to go to Diaz, as he has a very affordable, $700k, one way deal. But McIlrath also signed a one way deal, meaning that the former 10th overall draft pick would have to clear waivers in order to get back to Harvard. Skjei’s contract is two way, so he could bounce back and forth, but many people think he’s NHL ready now. What if he surprises everyone at camp, and the team would like to keep him or use him. Maybe they move Klein, an often talked about possibility, or maybe the team stays as-is and Diaz is the seventh defenseman. Whatever the scenario, there will be some movement on the back end, whether it be a trade or something minor. 5) Is this team better than last year’s team? My first thought is yes, this is a better team than last year. The team is much deeper through the four lines after the moves made by Gorton. There is a lot of young talent with a ton of upside on the roster, mainly guys like Etem, Miller and Fast. There is a lot of versatility too. Vigneault could use Kevin Hayes, JT Miller or Oscar Lindberg as the third line center, or he could move Hayes, Miller or Stalberg to the second line in the right wing slot. That means endless combinations, flexibility in case of injury or inconsistency, and a lot of options. Lindberg or Stalberg would be an upgrade over Glass on the fourth line, providing good defensive play and a lot more offense. Same fantastic defense and goaltending. Deeper, four line offense with scoring throughout. This could be a championship caliber team. Posted on July 28, 2015, in In the Crease and tagged Brady Skjei, Carl Hagelin, Chris Kreider, Derek Stepan, Dylan McIlrath, Emerson Etem, Jeff Gorton, Jesper Fast, JT Miller, Kevin Hayes, Kevin Klein, Klein trade, Madison Square Garden, Martin St. Louis, MSG, New York Rangers, New York Rangers blog, NYR, Oscar Lindberg, Rangers, Rangers blog, Stepan arbitration, Stepan cap hit, Stepan contract, Tanner Glass, Viktor Stalberg. Bookmark the permalink. Leave a comment.